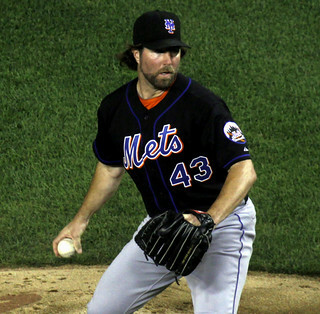 Multiple media sources are reporting that 2012 Cy Young Award winner R.A. Dickey is on the verge of being traded to the Toronto Blue Jays. Reportedly, the Mets will receive top prospects including catcher Travis d’Arnaud and outfielder Anthony Gose. The Blue Jays have already improved with some major acquisitions this offseason. They made a blockbuster trade with the Marlins acquiring Jose Reyes, Emilio Bonifacio, Josh Johnson, and Mark Buehrle. They also signed free agent Melky Cabrera. Acquiring Dickey puts them in the top tier of American League teams heading into the 2013 season. The Mets will acquire some sorely needed catching and outfield help. Both d’Arnaud and Gose are considered high potential prospects which is what the Mets have been after since the season ended. And with contract extension talks stalled with Dickey, the Mets are clearly ready to head in another direction. If the Mets are dealing Dickey, I find it confusing that they’d extend Wright…for what? Why would he especially want to sit tight through a rebuild?? It is confusing. But I don’t think the Mets are planning to be competitive until 2014. So Wright will have to sit through at least one more miserable season.